Coach Mike Noakes' Knights not only dominated the Central Section, but competition from coast to coast, finishing the season with an 28-2 record and rankings of No. 1 in California and No. 2 in the nation. Led by catcher-pitcher Todd Johnson and undefeated left-handed pitcher Bobby Waits, the team won the Fresno Easter Classic, the Colonial Baseball Classic in Orlando, Fla., the North Yosemite League title and the Central Section Yosemite Division championship. Along the way, the Knights attracted national attention from ESPN and USA Today. _Johnson hit .429 and slugged 12 home runs. He also compiled a 10-2 record with 88 strikeouts and a 1.64 ERA on the mound while often facing the opposing team's ace pitcher. 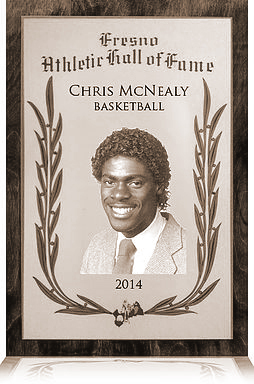 He was named The Fresno Bee's Player of the Year for the second consecutive time. _Waits followed an 11-0 junior campaign with a 10-0 record to close his career with nary a loss and earn all-section honors. 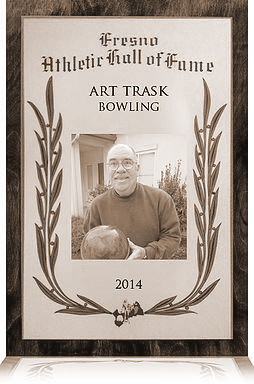 As for Noakes, he repeated as The Bee's Coach of the Year. Shortstop Robert Swanbeck was also an all-section choice by The Bee. He hit .402, had 24 RBI and stole 13 bases while anchoring the infield defensively. _It was the second Yosemite Division crown in a row and third in the 1980s for Bullard. The Knights walloped second-seeded Hanford 15-2 in the title game, as third baseman Darrick Walker drove in five runs and Waits was the winning pitcher. 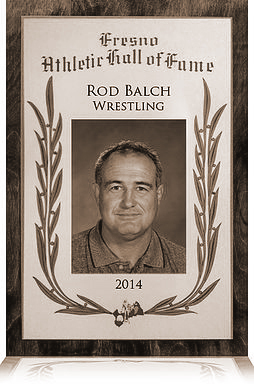 An All-American wrestler at the high school, community college and collegiate levels, Balch excelled as a coach, too, leading Clovis High School to three consecutive California State team championships (1990-92). This combination of excellence made him one of the most-decorated individuals in the sport from the Fresno area and culminated in his induction into the California Wrestling Hall of Fame in 2014. In addition, his son Andrew won the 145-lb. pound crown at the CIF State Championship in 2008, enabling the Balch's to become just the third father-and-son combination to claim gold medals in the event's history. Competing at 135 pounds, Rod claimed his state title in 1974 while wrestling for Clovis High. The 1975 season brought more acclaim as he compiled a 40-4-1 record en route to winning the California Community College championship at 142 lbs. for state champion Fresno City College. A move to CSU Bakersfield the following season proved fruitful for Balch. During his three seasons with Coach Joe Seay's Roadrunners, he totaled 96 victories, including 21 by pins, captured three conference titles and was a two-time Division II All-American, finishing second and fifth in the NCAA Division II Championships. While Balch was competing for the Roadrunners, they won national titles in 1976 and '77 and were the runners-up in '78. Balch then graduated from competing on the mat to coaching at his alma mater, Clovis High. Over 15 seasons with the Cougars, his teams won 8 North Yosemite League Championships, 7 Central Section Championships and 3 CIF State Championships, and he was named California State Coach of the Year. Balch coached four Cougars to a total of six individual state championships: heavyweight Ken Fontes (1987), Jimmy Aguirre (1989, 105 lbs. ; 1990, 119 lbs. ; 1991, 125 lbs. ), Ralph Olivas (1990, 138 lbs.) and heavyweight Chad Mast (1993). Playing for Jerry Tarkanian at San Joaquin Memorial High School, the 6-foot, 6-inch Cleary was the star of the team, even helping the Panthers upset powerhouse Edison High in 1957. But it wasn't until Cleary took over as Memorial's coach that the Panthers would end years of frustration by winning their first league championship in 1968. _Once they got a taste of winning under Cleary, Memorial developed into a state power that dominated headlines and attracted scores of college recruiters to their games. _In Cleary's 11 seasons at the helm, the Panthers compiled a 195-78 record. They won six North Sequoia League titles, three CIF Central Section championships (1970, 1972, 1973) and swept the prestigious Tournament of Champions - the forerunner of the state championships - in 1972 and 1973. _During one span, the Panthers won 49 straight NSL games. More impressively, in the six consecutive seasons that Cleary had Roscoe, Clifton or Sammy Pondexter on his roster, the Panthers won 129 of 151 games against competition that included some of California's top high school programs. 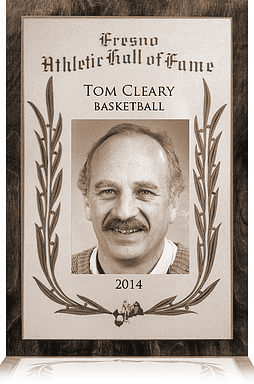 _Cleary was honored as the 1972 California High School Basketball Coach of the Year by Cal-Hi Sports following Memorial's 27-2 season and first TOC title. He was The Fresno Bee's All-Metro Basketball Coach of the Year in 1970 and 1973. _Roscoe Pondexter graduated from Memorial as California's all-time boys' high school scorer with 2,288 points, and Clifton Pondexter was a first-round draft pick of the Chicago Bulls in the 1974 NBA draft. David Tucker, another athlete coached by Cleary on the Memorial basketball team, set the national high school triple jump record. _Following his coaching career, Cleary became a dedicated community volunteer who gave many hours to helping the homeless at the Poverello House and other individuals in need of help. 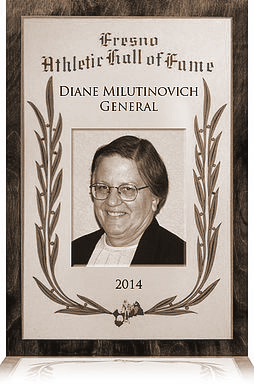 Milutinovich was a nationally recognized and much-honored advocate for women's athletics during her 27 years at Fresno State, a time in which the university made significant strides with its female sports programs. _For 22 of those years, the Fresno High School and Fresno State graduate served in administration, rising to associate athletic director and senior woman administrator. During that span, she supervised 15 different sports. Among them: softball, volleyball, men's and women's soccer, women's basketball, wrestling, swimming and golf. _Beyond Fresno State, she served as tournament director for more than 30 NCAA postseason events in four sports, including 17 softball regionals and 16 men's soccer matches. _In 2010, after leaving Fresno State, Milutinovich received the National Award for Distinction from the Collegiate Women Athletic Administrators. Between 1993 and 2008, she received similar honors on the state level four times -- including recognition as the California Senate's Woman of the Year in the 16th District. _State Sen. Dean Florez said that the Women of the Year honor was awarded in recognition of Milutinovich's "many contributions to women's athletics and her unwavering fight for gender equity in higher education." _Milutinovich's advocacy for Title IX implementation and equity between men's and women's athletics often put her at odds with those who viewed athletics primarily as a man's domain. But she pressed forward with courage, ignoring the risks to her career. 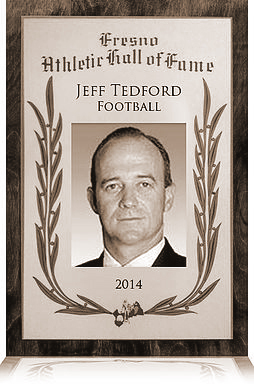 The Tedford name is synonymous with success, quarterbacks and high-scoring offenses. As a record-breaking quarterback under Jim Sweeney at Fresno State, he led the Bulldogs to the 1982 PCAA conference title and a last-second 29-28 victory over Bowling Green in the California Bowl. _As an offensive coordinator, he was pivotal in the rise to national prominence enjoyed by the University of Oregon in the late 1990s. _As the head coach at California, starting in 2002, he rebuilt a program that had gone 1-10 the year before and hadn't had a winning season since 1993. When he left Cal after 11 seasons, Tedford held school records for victories (82), conference victories (50), bowl victories (5), games coached (139) and most Big Game victories vs. Stanford (7). During Tedford's reign, Cal finished in the Coaches Poll Top 25 four times, highlighted by a No. 9 national ranking during a 10-2 campaign in 2004. And he was the two-time Pac-10 Coach of the year. _But the numbers, glossy as they are, don't begin to tell the whole story. Tedford earned acclaim for his ability to develop players, particularly quarterbacks. As a Fresno State assistant, he took Trent Dilfer from a raw talent into a first-round draft pick. With Oregon, he worked with future first-round picks Joey Harrington and Akili Smith and, at Cal, he oversaw the maturation of Aaron Rogers and Kyle Boller. Under Tedford, the Bears had eight players eclipse 1,000 yards rushing in a season, including future NFL star Marshawn Lynch. _Tedford earned all-league honors as a quarterback at Warren High School in Downey, and played two years at Cerritos College before coming to Fresno State, where he threw 35 TD passes in two seasons. 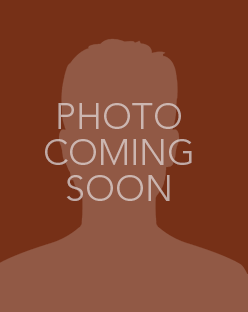 After Fresno State, he played six seasons in the Canadian Football League. At the time of his FAHOF induction, Tedford was offensive coordinator for the NFL's Tampa Bay Buccaneers.